Jennifer Edwards of JenEd Productions LLC has toured the US and Canada, performing works and presenting workshops that dive deeply into the inner workings of one’s mind and body. Jenifer is an award-winning writer, choreographer, teacher, and performer who has learned that “both education and performance are very helpful in people’s healing processes, decision-making, career-building and life-learning.” Her written works have been published in The Huffington Post as well as several online blogs. JenEd Productions LLC is a creative company, founded by Jennifer Edwards. Through online and live engagements, we explore the human experience, provide educational opportunities and products, and help people to heal and grow. Insightful: Through JenEd Productions, I hope to inspire people by sharing insights, both experienced and observed. JenEd is also incite(ful), as much of the teaching, spoken word, and written work is meant to incite – to stir people’s emotions and elicit a response, thereby deepening people’s self-knowledge. Iterative: Every piece and workshop feeds the next. What I learn from dance, I apply to writing, what I learn from yoga and therapeutic work, I apply to performance, what I learn from art and life I apply to teaching. Every experience provides tools, raw material, and information with which to build new and reshape older works. Inclusive: I am interested in dialogue. Projects that include multiple voices, stories, and perspectives interest me. I’m inspired most by what people can build together, in collaboration. 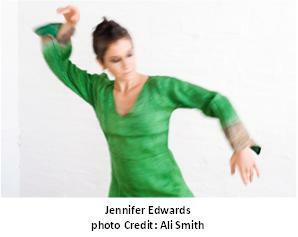 Where do you see dance in the future and how does JenEd fit within that vision? I see the discipline and in-depth study of dance as a lifestyle and a way of approaching the world. I see the future of dance relying heavily on those within the field being able to come to terms with and embrace the notion of dance as something beyond technique and performance. JenEd Productions is a company built to contain the various aspects of my work and the multiple platforms my projects traverse - film, app, audio recording, blog, installation, and workshop. JenEd Productions represents me and all of the various hats I wear; however, everything I do is somehow informed by the fact that dance is a part of my life and has been since age three. Dance has given me the structure and self-discipline to be an entrepreneur, to pursue every one of life’s challenges with curiosity, in the spirit of exploration and in service of collaboration. Through a project and app called Grounded, I teach kinesthetic awareness and stress management for varying populations including medical and business professionals, kids, parents, artists, at-risk teens, LGBTQ youth, and people living with cancer and HIV/AIDS. I also lead seminars in entrepreneurism for artists and students, some of whom study the arts and some who study business. To date, I’ve published over one hundred essays, poems, and articles about dance, health, technology and politics. To me, the future of dance is something that is more human, more holistic, more integrated into people’s lives and integrated with other art forms. I view choreography as the act of exploring ideas using space, time, and physical-mental-emotional effort. I apply my choreographic skills to create more traditional dance work or movement direct plays, with exactly the same mindset as I do when I construct a stress management training session for financial advisors or survivors of domestic violence. In this way, I hope that JenEd represents the future of dance. We are training far more dancers than there are companies or resources to sustain. Therefore, it is imperative to understand the utility of our training beyond the studio. I see the future of dance containing individuals who are articulate, who know their value, and can easily work on and off the stage. JenEd Productions also represents a model that we will see more of in the future. It is a single-founder, for-profit, pick-up, collaborative company that leverages technology, public interest, and the internet to grow its brand and its “tribe” while engaging with people – near and far. Also, at this point in time, JenEd Productions performs very little dance on stage. The company infuses dance-sensibilities into work done out in the world and online. What has been the main focus of your outreach workshops and seminars? Workshops and seminars generally focus on two things: managing stress (a program I call Grounded) and entrepreneurship. While I am generally engaged to focus on just one of these topics, they are very much interrelated. Both rely on developing skills of seeing the world from a broader perspective, being adaptive, being proactive (rather than reactionary), understanding your reactions, building self-care habits that sustain your creative work, and developing a tool-set that you use all day, every day. I also teach the kinesthetic awareness components that accompany both entrepreneurism and stress management. Showing up fully – whether when pitching a project to an investor or funder, making hard life-choices, or working with a collaborator – entails feeling grounded in your body, emotions, and thoughts. Of your current projects, which has been your favorite? Why? I do not think I could pick a favorite project, so I will choose my most current – Visiting Hours. Visiting Hours is an on-going project focused on human connection and the activity of visiting with one's self in the company of or in relationship to others. I began this exploration by excavating my own history and sitting with fragments of memory through art works I created over the last 15+ years. These were the bits and pieces of poems and movement that haunted me and would not rest until I brought them back into the studio, shared them with others, and allowed them out into the world (again). While this exercise was interesting to me, I was much more intrigued with how I could involve more people in what I found was driving my own search: an understanding of core human needs - things like feeling safe, living your beliefs, knowing what you want and why, and deeply experiencing what it feels like to be alive in a human body. Therefore, Visiting Hours is an endeavor that will be shaped and inspired by every single person who wishes to participate. There are now 101 participants, from 19 U.S. states and four countries, in Visiting Hours 1:1, a short-form story telling installment of the piece that launched on January 20, 2014. I am in conversation with several organizations and venues to bring Visiting Hours, as a participatory, reflective installation, to their communities. Essentially every project has the same goal: to provide the impetus and space for people to have an opportunity to discover something new about themselves: a new lens through which to see an idea, to solve a problem, to experience a memory, to sit in the moment, to be challenged and feel OK with what comes up.